Edward Doty and his uncle Stephen Hopkins sailed on the Mayflower in 1620. Doty was listed as Hopkins' servant because servants were considered part of the immediate family -- nephews weren't -- and that meant more land in the New World. Neither Doty or Hopkins were Puritans. My friend Roy Scarbrough's ancestors owned the Mayflower, and they hired Doty and Hopkins to look after their investment. Both had previously made voyages to Jamestown. Edward Doty was a bit of a rascal. He incited a mutiny aboard ship, and started the first duel in Plymouth over a woman. As punishment for the duel, Doty and his opponent Edward Leister were ordered by William Bradford to be put in stocks in the town square but their cries became so pitiful and annoying that the townspeople begged Bradford to let them go. And he did. Edward Doty and his son Thomas were frequently hauled into court on charges that ranged from debt issues to allowing their hogs to run through their neighbor's corn field at harvest time. Edward was fined several times. Thomas, however, known locally as a storyteller, was usually able to talk his way out of trouble. Hopkins also had a few brushes with the Plymouth authorities, including opening a shop that served alcohol. In 1637, he was fined for allowing patrons to drink and play shuffleboard on a Sunday. The Hopkins-Doty home became a favorite hangout for local Native Americans. Both Doty and Hopkins knew the native sign language, and Hopkins was fluent in several Indian languages. When the native leader Samoset walked into Plymouth and welcomed the English, he was housed in the Hopkins-Doty home for the night. Hopkins and Doty were sent on several goodwill missions to neighboring tribes, and they were present at the first Thanksgiving. 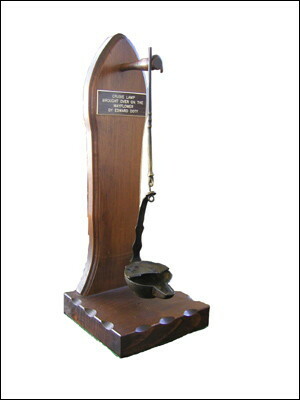 The photo shows Edward Doty's oil lamp he brought with him on the Mayflower.